Easter. A time of egg-painting, baskets full of candy, and Easter bunnies. At least that’s what it’s like in the United States. But have you ever wondered how holidays are celebrated in other countries? Yes, Easter was a few days ago. But we thought it would be fun to learn about some Easter traditions found in Jamaica! Jamaicans also associate Easter with eggs, but not in the same way Americans do. One of the mythical Easter traditions in Jamaica involves using an egg to predict your future. The belief is if a person puts an egg white in water on the night of Holy Thursday, his or her future can be seen on Good Friday. It is said that the shape the egg forms in the water over night is what is in the future. For example, if the egg resembles a ship, travel is in the future. One of the most common and widespread traditions in Jamaica is eating bun and cheese. Bun is a variation of an English hot cross bun, but with a tropical flare! 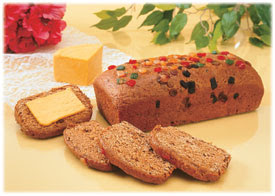 Baked into the bun are ingredients such as cinnamon, nutmeg, raisins, and other dried fruit. Yum! With the bun, Jamaicans will typically eat cheddar cheese. As far as decorations go, a Jamaican Easter is often associated with Easter lilies. During this time of year, Easter lilies are in bloom on the island. Churches and homes are decorated around Easter with this beautiful flower. Over time, these lilies have come to represent virtues such as purity and innocence. Children in schools typically get a break for Easter that lasts about 2 weeks. This is because there is no spring break in Jamaica and Good Friday and Easter are considered public holidays. The Monday after Easter is also a day of celebration! Often people will be found on the beach, flying kites, and attending various shows and events. If you’re interested in seeing more Jamaican cultural traditions firsthand, join us this fall on one of our 3 projects! For more information, visit gsjamaica.org!